See why NarroWay is the premier Christian theater of the South! Take in a delicious dinner and a hearty serving of Southern hospitality as every audience is greeted and served by the NarroWay cast. Live animals, talented actors, original scripts, inspiring music and a delicious meal themed after the show are all part of the NarroWay experience. Enjoy the finest entertainment in the South, with fun-filled dinner shows in a schedule that runs year-round! 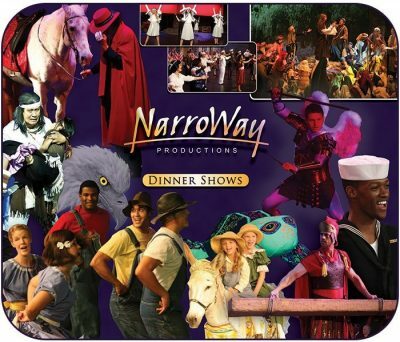 Adding new shows each year, NarroWay features a variety of original, large-scale, Broadway-style musicals; spectacular holiday shows for Christmas and Easter; epic biblical productions; mystery theater shows; day trips; children’s field trips and more! Located just outside Charlotte, The NarroWay Theatre can turn any trip into a fun-filled, Christian experience! See website for complete schedule details. Funny, tragic, patriotic and filled with hope, “Samson” is as relevant as the 6 o’clock news. Step back in time…before the kings and after all the deliverers were at rest, there was a time of judges – when every man did what was right in his own eyes. 3000 YEARS AGO, OR TODAY? Take in a mid-day mystery theater at NarroWay! Round up your posse or bring your partner and settle in for a heapin’ helpin’ of low country barbecue and a hog-wallerin’ good time with “The Wild West Barbecue Mystery Dinner Show.”It’s part game, part show, and ALL FUN! Set in 1926 and based on a true family story, this fast-paced musical dinner show takes you to East Tennessee, where the fun never ends! Sing along with fabulous old Southern classics and watch the gospel truths unfold through the eyes and imagination of Tennessee! Have hands-on fun and meet the NarroWay animals up close and personal! Add on a petting zoo experience to any children’s show, mystery theater, birthday party or experiential tour. Or, schedule a day for your group to combine camel rides with a petting zoo at the NarroWay Theatre. NarroWay has a host of friendly animals just waiting to meet you and your friends. Say hello to Sheba the Camel, Blue the Horse, Gabriel the Donkey and a host of other donkeys, sheep, goats and even pot-bellied pigs.